I’ve tested a dozen machines but am confident that the Stamina Avari Magnetic Rowing Machine is the best magnetic rowing machine for everyday use. It is well built, virtually silent and very smooth. Add in the fact that the resistance is easy to adjust and you have everything you need to complete a challenging workout. I’m not a rower so I’d always dismissed the rowing machine. That was until one day in the gym when I discovered one of my best friends on the machine. The fact that he runs marathons made me want to know more. It didn’t take me long to find the best magnetic rowing machine currently available. A rowing machine works your hamstrings, glutes, quads, rear calf muscles, abs, chest, shoulders, biceps, triceps, wrists and your back muscles! It doesn’t just make you stronger and fitter it works almost every muscle in your body. I may have ached after my first session but I noticed an almost instant decrease in my running times! This is even better than the best upright exercise bike I was using. The Stamina Avari is one of the quietest rowing machines on the market. It looks stunning and has a good array of features to ensure you’ll get an effective workout no matter what your current fitness level is. Stamina was founded in 1987. Its aim is to provide innovative and affordable exercise solutions for everyone. They have a broad distribution base but they also have introduced an impressive number of products to the market; including the Aero Pilates Performer and the Instride Walker. This dedication to providing high quality products is part of the reason that the Stamina Avari is so good. Magnetic rowers work by having a magnetic next to a spinning wheel. The closer the magnet to the wheel the more resistance you’ll feel. It doesn’t matter how fast or slow you row; the resistance will be the same. This is an effective method of controlling resistance but it also ensures the Stamina Avari is very quiet. The only noise you’ll hear is the wheel spinning as you slide your seat in and out. This isn’t loud enough to stop you watching TV as you row! The resistance can be controlled from the LCD screen; simply push the arrow to increase or decrease the resistance. It is easy to do while you’re rowing; allowing you to mix up your workout and keep it interesting as well as challenging. Perhaps my favorite part about magnetic resistance is that the resistance is the same whether I row slowly or fast; you can’t do this with an air rower. The LCD console gives you access to 12 workout programs. This includes 4 custom options, 1 heart rate and a manual option. The heart rate program adjusts the settings according to what your heart is doing. You’ll also find the usual information such as calories burned, stroke, distance, time, etc. Using the Stamina Avari gives you a full body workout. But this experience is enhanced by the slight incline built into the seat. You’ll need to use a bit more muscle in your leg to get going than you would on a standard machine. That can make a big difference to the overall results. The seat itself is padded and comfortable, even if you want to complete an extended workout. 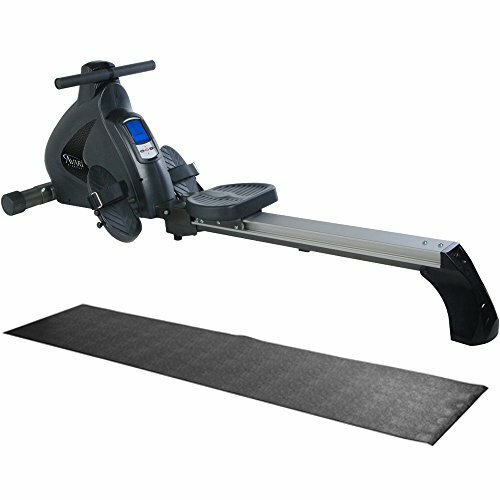 This is the best magnetic rowing machine which makes it very hard to find any faults. However, although this machine can monitor your heart it is done via a chest strap. It would be nice to see this built into the handle. If you’re using this for exercise then the fact that it doesn’t give the same feel as rowing on water is not really a disadvantage. However, if that feel is important then you may need to choose the best rowing machine that isn’t magnetic. Sunny Health & Fitness have been supplying high quality exercise machines for over 20 years and are committed to providing the best possible equipment at the right price. The Sunny & Fitness SF-RW5856 may not have the easiest name but it certainly fits the bill for quality and price. The first thing to note is that the Sunny Health & Fitness SF-RW5856 has an 11 pound flywheel which ensures you have to put a consistent effort into pulling the cord back for every stroke. The magnetic tension can then be adjusted to give a secondary resistance and increase the level of your workout. This design has proved to be popular as many users appear to be comfortable on level 5 or 6; leaving room for improvement. The machine has been built to handle weights of up to 285 pounds; that’s a testimony to how solid it is. Unless you’re at this weight then the Sunny & Fitness SF-RW5856 will be performing under capacity and should last for years to come. The seat is well padded and comfortable; you’ll also note that the foot pedals are larger than the norm; this is to ensure your feet are safe and won’t slip while rowing. The LCD console is exceptionally easy to reach; allowing you to see all your vital statistics; including calories burned, stroke rate, distance, time and even the RPM. There is also a workout button which will allow you to set your own goals for each session; helping you to get the most from the Sunny & Fitness SF-RW5856. It’s also nice to see transportation wheels. This makes it easy to lift one end and wheel the rowing machine out of the way until you need it again. You can also fold it in the middle by removing the clips; to help if storage space is limited. Finally, there is a tablet holder which allows you to utilize your tablet while rowing for music or even watching your favorite shows. When you’re in the middle of an intense workout the last thing you want to do is stop to adjust your resistance. Sadly it is necessary to stop the Sunny Health & Fitness SF-RW5856 to do this. It is also disappointing to note there is no heart rate monitor with the machine. Monitoring your heart rate is critical to getting the right results from your workout. Merax is a comparatively young company; having been founded just over 20 years ago. They offer practically any product you can think of from fitness to office supplies. But, they have a simple motto; high performance & efficiency are the most important criteria for any product. 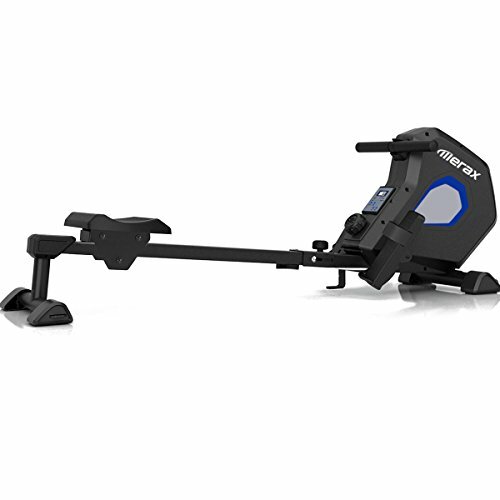 The Merax magnetic rowing machine is perfect if you’re on a limited budget and offers a surprisingly amount of features. 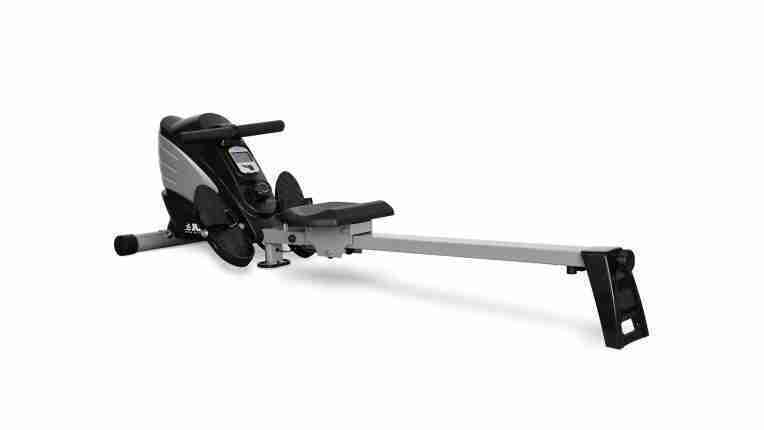 The Merax magnetic rowing machine is actually a very attractive looking machine. It is made from steel and built to support weights up to 264 pounds; that’s why it is proving to be so durable. The steel frame is powder coated black and won’t chip easily. The pedals and flywheel cover are ABS plastic; the rest is all steel. The seat itself is well padded but also features a non-slip coating. It has 3 sets of wheels to help the smooth operation and the footrests actually pivot; ensuring maximum comfort. The LCD console gives you plenty of information; including time spent exercising, calories burned, stroke rate, total strokes and the distance. All the information can be found by manually scrolling through the screen but you can also simply leave it to scan and show you each piece of information in turn. A nice touch is the 15° rail; similar to the SF-RW5856. This forces you to put more effort into each rowing movement; increase the effectiveness of the workout. A simple knob on the front of the main console can be twisted to adjust the tension. As you can see from the dimensions above this is not an excessive large machine. The fact that it can be easily folded and then stored standing up is a bonus. This is made easier by the addition of transport wheels. Simply remove the clips and lift one end of the machine to fold it; then glide it across the room into your desired storage location. Monitoring your heart rate during exercise is essential but there is no option to do this with the Merax magnetic rowing machine. You’ll need a separate heart rate monitor. This is disappointing. If you’re exercising then you want to be able to see the screen without having to slow down. Unfortunately this can be difficult on the Merax magnetic rower; the screen is not backlit so in poor light or even f you’re directly under artificial light; it can be hard to read. There are several types of rowing machine available. Without doubt the air resistance Concept2 is the one you need if you’re interested in competitive rowing. 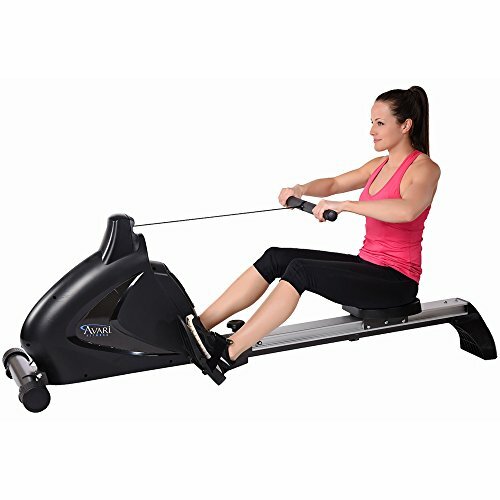 But, if you’re looking for fitness, cardio and to improve your results in other activities then you need the best magnetic rowing machine. These are quite, effective and relatively compact; making it easy to store them when not in use. 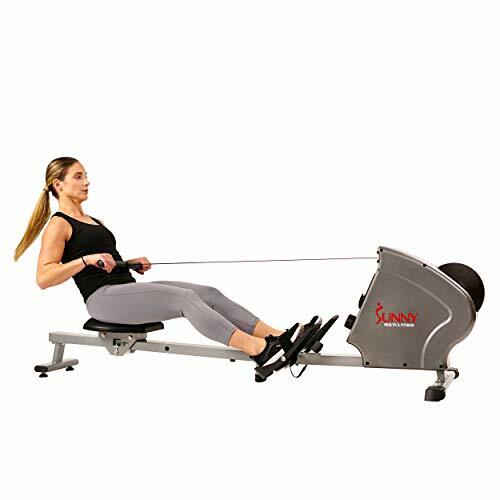 There are plenty of good examples on the market but the Stamina Avari Magnetic rowing machine is the best magnetic rowing machine thanks to the quality of the build and the ease in which you can use it. That’s why I’ve got myself one and use it regularly.